Breaking down the challenges with 347V & 480V for lighting devices. Many LED & conventional lighting products are designed to derive power from standard 120V or 240V power sources. Power supplies for these devices (typically called “Drivers”) may be designed to operate at either of these voltages, or often, at any voltage between 100-277V (universal input supplies). Many commercial & industrial installations receive primary power at 347V (in Canada) or 480V (US), which often exceeds the rated input voltage for most lighting products. It is hazardous to operate a device beyond its rated voltage & is not acceptable by the local electrical authority. Note: Electrical supply in both Canada and the US typically operates at 60 Hz (frequency). Nominal Supply Voltage – U.S.
What happens if the supply and fixture voltages are incompatible? A supplementary device that reduces or “steps” the voltage down is required. This is when an installer would use a step-down autotransformer. Autotransformers are a simple and reliable style of transformer consisting of a single coil wound around a steel core that takes a higher voltage input (e.g. 347 or 480V) and “steps it down” to a lower voltage (e.g. 240V or 120V). Tip: These transformers must bear Safety Certification markings to show compliance with safety standards to the local electrical inspection authority. E Craftsmen designs and manufactures a variety of component step-down autotransformers for this purpose. Click here for further information. 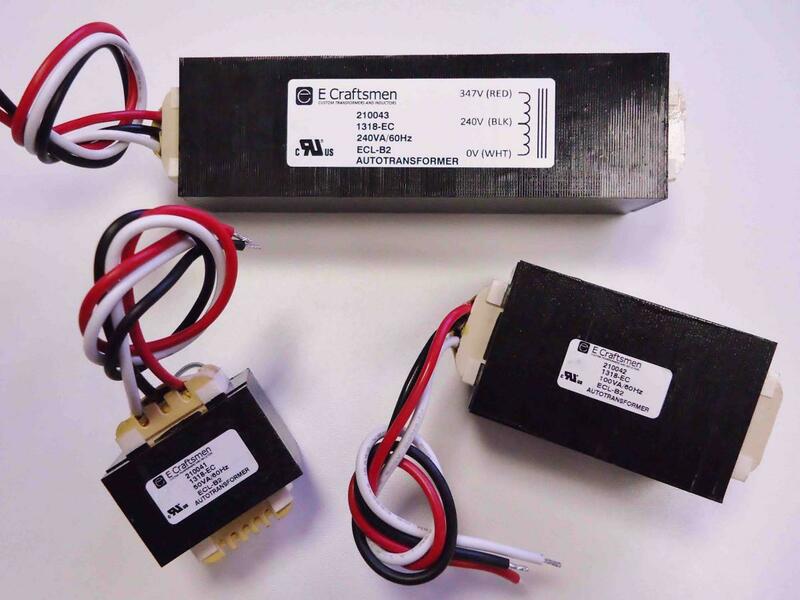 UPDATE: E Craftsmen now also offers an alternative premium Mean Well LED Power Supplies for 347V and 480V source voltage applications to simplify installation and lighting design. Read more about them here. Safety and reliability are our top priorities. Take advantage of our no obligation quote.